If you're on the hunt for a casual yet incredibly chic outfit, make a black and white leather biker jacket and black and white tapered pants your outfit choice. As well as very comfy, these garments look fabulous together. Up the cool of your ensemble by completing it with Givenchy carpet pattern studded leather sandals. If you're in search of a casual yet absolutely chic outfit, go for a dark brown fur vest and black leather skinny pants. Both of these garments are very comfy and they also look incredible together. Amp up the cool of your outfit by complementing it with Givenchy carpet pattern studded leather sandals. If you're on a mission for a casual yet chic look, consider pairing a charcoal sleeveless coat with black leather skinny pants. Both items are very comfortable and look amazing when paired together. Complement your look with black studded leather heeled sandals. If it's comfort and functionality that you're looking for in an outfit, make a white skater dress your outfit choice. And if you want to instantly amp up the style of your look with one piece, enter black studded leather heeled sandals into the equation. If you're hunting for a casual yet incredibly chic look, pair a black studded leather biker jacket with a black leather shift dress. These pieces are very comfortable and they will also look wonderful paired together. Wearing a pair of Givenchy carpet pattern studded leather sandals from Saks Fifth Avenue is a simple way to add extra flair to your look. If you're hunting for a casual yet incredibly stylish ensemble, pair a white and black horizontal striped coat with navy skinny jeans. As well as very comfortable, both garments look stunning together. 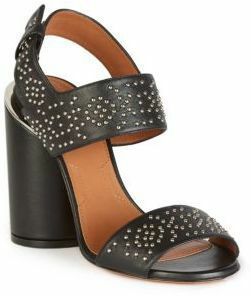 Givenchy carpet pattern studded leather sandals will instantly lift up even the laziest of looks. Make a white vertical striped off shoulder dress your outfit choice to be both neat and relaxed. Got bored with this outfit? Enter Givenchy carpet pattern studded leather sandals from Saks Fifth Avenue to switch things up. If you're on the hunt for a casual yet absolutely chic ensemble, marry a white vertical striped button down blouse with light blue denim shorts. These two garments are super comfortable and they also look incredible paired together. Up the cool of your ensemble by wearing Givenchy carpet pattern studded leather sandals. If you're hunting for a casual yet seriously chic ensemble, consider wearing a blue blazer and a black lace sheath dress. These two pieces are super comfortable and will look incredible when paired together. 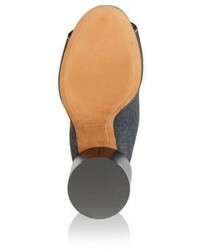 When it comes to shoes, this getup is finished off nicely with Givenchy carpet pattern studded leather sandals.